Founded in 2006, Southwest Fertility Center for Men is proud to have helped hundreds of couples conceive biological children. 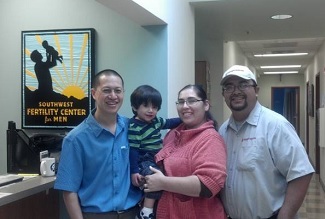 Dr. Wayne Kuang of Southwest Fertility Center for Men is the only fellowship-trained vasectomy reversal doctor in the state of New Mexico. We are committed to helping you conceive a child naturally. Below are some of the most common vasectomy reversal questions we receive at our male fertility clinic. If I had a vasectomy, what are my options to have a child? The reversal of your vasectomy is a wonderful option that should allow you and your partner to have children naturally. While in-vitro fertilization is another option, the rates of pregnancy are about the same. Many couples prefer vasectomy reversal over in-vitro fertilization because IVF increases the chance of having twins or triplets. What is the success rate of vasectomy reversal? If you’re considering reversing your vasectomy, choose Southwest Fertility Center for Men, where Dr. Kuang has a vasectomy reversal success rate of more than 97%. I had a previous failed vasectomy reversal. What are my options? Dr. Kuang has performed successful vasectomy reversals on men who have previously had vasectomy reversals that did not work. His specialized training and experience at performing this microsurgery greatly increases your chance of success. Do men stop making sperm after a vasectomy reversal? No. The body continues making sperm after a vasectomy, but it cannot travel out of the testis through the vas deferens, which have been cut. How long after a vasectomy reversal until sperm appears in the ejaculate? It can take less than 1 month and up to 12 months for sperm to start appearing in the ejaculate after a vasectomy reversal. How long until my partner becomes pregnant after vasectomy reversal? Men turn over their sperm reserve every 3months, and it usually takes a couple of turnovers after vasectomy to get sperm counts to the level where pregnancy can occur. Typically, it takes 12 months for pregnancy to occur after vasectomy reversal. I had a vasectomy more than 10 years ago. Will vasectomy reversal work? Dr. Kuang’s vasectomy reversal success rate for those more than 10 years old is 95.9%, almost identical to those less than 10 years old at 98.5%. Will I need a complex reversal of my vasectomy? Dr. Kuang is a leader in his field and even developed the “Vasectomy Reversal Predictor”, a program that predicts whether you will need a routine or complex vasectomy reversal with an accuracy of over 80%. About 25% of his patients who have had a vasectomy for less than 10 years need a complex reversal at Dr. Kuang’s fertility center. About 68% of his patients with vasectomies more than 10 years old need complex reversal. Are there any side effects to vasectomy reversal? Typically, side effects include swelling, discomfort and bruising immediately after vasectomy reversal. Hematomas, long-term pain and testicular atrophy are exceptionally rare side effects that may occur after reversal. Dr. Kuang will discuss vasectomy reversal side effects during your consultation. If you have questions about vasectomy reversal, contact us for a FREE consultation! Dr. Kuang provides free consultations in our Albuquerque, New Mexico male fertility center, as well as phone consultations for those living out of state. Questions about vasectomy reversal? Call Southwest Fertility Center for Men at 855-4VR-CONSULT (855) 487-2667 for a FREE consultation.